I recently met up with Chad Cochran with the American Alpine Institute (AAI) for a shortened, 1:1 version of AAI’s Alpine Mountaineering and Technical Leadership 2 (AMTL2) course. The AMTL course is a 4-part series, with the primary goal of Part 2 to make you a qualified rope team leader on rock and glacier routes. My seven days in the North Cascades focused primarily on rock and alpine rock climbing: we spent time climbing in Leavenworth, worked on rock rescue skills, basic alpine aid climbing, a big day climbing the Five Spires of Washington Pass, more rock rescue, my first alpine rock leads up on a student-led trip up Black Peak, and just lots and lots of climbing. Overall, I feel like I greatly increased my knowledge of rock climbing systems and safety, as well as my confidence in leading on easy or moderate alpine climbs. I was out in Washington State for work during August and basically signed up for this course at the very last minute since I wasn’t sure whether I would be able to take some time off or not… There was a set start date for an AMTL2 course at this time, however, no one had signed up for it. The course is typically 12-days and includes a four-day Learn to Lead course in Leavenworth and then a more alpine focus, followed by a student organized and led trip at the end. The exact details and climbs are dependent on the students’ skills and interests. If no one else signs up for your course, they will just truncate the course to 8-days and run it one-on-one. I was actually fine with doing it one-on-one because it would mean taking less time off work and also breezing through things that might be old hat, while focusing on new skills. Due to scheduling conflicts on my part and AAI’s, we weren’t able to do 8-days, so they prorated the course and we did 7 days instead. I headed up to Bellingham on the Monday night before the start of my course and met up with my buddy and old Seneca climbing partner Sameer… Back in May I foolishly talked my regular climbing partner into leaving DC and moving across the country to Bellingham where there’s loads of real mountains, cheap living, and a progressive and active community. Good for him, but D’OH! on my part… now I’d need to find new climbing partners. It was great to see him again and good catching up—he’d been having a pretty active summer and getting out a lot with his climbing roommates. He also let me crash on his couch, which was awesome. Tuesday morning I was up bright and early to meet up with Chad at the AAI office in Fairhaven at 7am. I was pretty stoked to climb with Chad because a friend of mine did an Alpine Ice course with him the year before, and because I knew he used to guide at Seneca for a number years. We actually spent a ton of time talking about beta for Seneca (which pieces to place where, which routes to try and lead next, etc) during our week together, which cracked me up since we were all the way out in the spectacular North Cascades! We did a basic gear check of what I had (I brought pretty much everything I had in a duffle bag and my packs), and picked up a few last minute items at AAI’s gear shop. We hit the road by 8am for the long drive out to Leavenworth. We arrived by noon, but stopped to pick up lunch and grab a camp site before arriving at the Mountaineer’s Dome around 1:30. Chad wanted to see where I was at so we started right off the bat with just building three, three-piece anchors at ground level using different gear (slings, cordelette, cams, natural pro, etc) so he could evaluate. I thought I did a pretty good job, and he concurred that all my pieces looked pretty good and that he’d feel comfortable coming up to them, but he also pointed out small improvements that I could make, or just slightly different placements that might improve it. After that we did a mini, two-pitch mock lead. I ran out the first one a bit much—guess I kind of just figured I was one top-rope / forgot / felt it was easy climbing. We ran into Dustin Byrne, who was my guide last year up the North Ridge of Baker, along with his client, and we invited them to come crash at our campsite that night. After that we headed up the road to another area known as Barney’s Rubble—you can approach climbs from the top and here Chad had me set up a (bolted) top-rope anchor and then rap down so he could check that out. Then at the base we ran through how the belayer escapes the belay from the ground, using something like a tree for an anchor. Munter-Mule-Overhands and all that were review, but it was good to run through it again. From there I just did some climbing on top-rope—hoping on a 5.7 layback climb twice before he put me on a harder 5.8, kind of overhanging crack climb. I struggled with this one quite a bit more as I haven’t really done much crack climbing and needed to really work through the technique. Not to mention that I’ve just mostly been doing easy trad leads this year… We headed back to the campsite around 6pm where we had dinner and hung out Dustin and Van, his client, who were heading off to do the North Ridge of Stuart the next morning. Wednesday morning we hit up the Icicle Buttress just down the road by 9am to climb a 4-pitch, 5.6 route known as R&D. It was a slabby, fun climb that was fun to follow. It’s nice to have 5.6 graded routes that aren’t totally sandbagged! The route went really quick—we hiked back down to the car by noon. Chad knew I’ve done a decent amount of multipitch climbing in his old stomping grounds at Seneca, and have started leading the easy stuff this year, but I think it was still part of his process of ascertaining where I’m at climbing ability and knowledge-wise for our hitting up this route. Chad was a little worried about our ability to secure a campsite up in the Washington Pass area because of the upcoming Labor Day weekend and the inevitable hordes of campers that would be heading out to the mountains, so we elected to pack up our camp in Leavenworth that afternoon and then make the drive up north. We arrived in Mazama at the Early Winters Campground by about 4pm and secured our spot in the small campground before heading down the road to cool little crag known as Fun Rock. It’s a ridiculous short approach from the road and has quite a bit of cool climbing to boot. I had expressed interest in learning the fundamentals of aid climbing—specifically alpine aiding, so we delved right into that. We went through the basics on the ground—setting up the slings, which ones you stand on, clipping into which piece and when, and then he set up a top rope on 5.8 crack climb so I could go to it. I started aiding from the base of the cliff on up through the crux section before switching over to free climbing the remainder. I thought it was all pretty cool, to be honest, and while it was slow and cumbersome working through the process at first, I felt like it got smoother and became a little clearer as I progressed. This process really helps you get a better feel for the security of your gear placements when you have to stand directly on them, which is one reason why I wanted to learn (I’ve been told that basic aid climbing is quite valuable for new leaders), and the other so I’d have the confidence and knowledge to get through cruxes I otherwise might not want to free climb. After that we from the ground we ran through the process of rock rescue if the leader were to take a factor two fall below the belayer—ie secure the leader to the anchor, rap down to them, ascend the rope, counterbalance rappel to the next anchor, secure them, then do a tandem rappel. It’s a convoluted and important process. We wrapped up by 7:30 and then headed back to camp. We arrived at the notch between Liberty Bell and Concord Tower about two hours after setting out from the trail. It was still quite cold, and we were stuck in the shade for the most part. We would be climbing the Southwest Face aka the Beckey Route (Grade II, 5.6). Chad set off on lead and wrapped around a corner out of sight—here we go! The route overall was quite enjoyable and interesting—there was nothing overly difficult or terrifyingly exposed—and featured chimneys, little cracks, some face climbing and slabby sections as well. 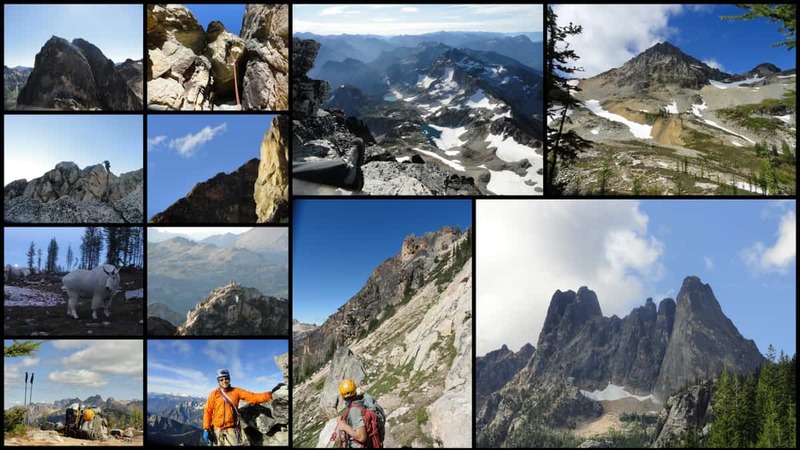 Quite a varied, yet moderate, climb—no wonder it is one of the most popular alpine rock climbs in Washington. We were lucky to be doing this route early on a Thursday morning with no other parties to be seen. We hung out on top of Liberty Bell for a brief snack and hydration break, but it was soon time to get moving again. One down, four to go. The learning goal for the day was primarily to just talk about transitioning between fourth-class and fifth class and general movement across a variety of alpine terrain, both technical and non-technical. Chad talked through a number of these points throughout the day, and while I wouldn’t be leading anything today, I was put in charge of all our descents throughout the day—nothing new from my time spent at Seneca, but he also pointed out different ways of managing the rope, clipping it in, throwing it, coiling it, etc, so you don’t end up with a stuck rope or end up in otherwise undesirable situations in an alpine setting—all very helpful stuff. We made a couple raps off the side of Liberty Bell to return to the notch where we began. From the notch we began ascending the North Face of Concord Tower (Grade II, 5.6). Again it was all fun, enjoyable climbing… Nothing really stood out to me except for the top of the last pitch which featured a strange, short little bouldering move… It was this kind of akward flaring crack that I struggled on for a bit before finally figuring some sort of sequence that got me through it. I noticed that the route description on SummitPost says “Note: if you are short the exit move out of the crack will seem much harder.” Well, I guess that explains it—or is at least my excuse! We rapped down the south of Concord, into the Lexington-Concord Notch where we could hit up spire number three, the North Face of Lexington (Grade II, 5.7). A short, fun climb up more quality granite… I remember we took a slight variation on pitch two which put us on this nice hand crack, now, my experience with hand cracks is pretty minimal, but it has been enjoyable getting on more of these crack climbs over the course of the week. Unfortunately, on this particular crack I blew it when my feet flew out and the fall tore a decent bit of skin off the back of my hand. I put my belay gloves on and gave it another go without a problem… Those Black Diamond gloves (BD Crag Glove) that I purchased before this trip got a lot of use and were great to have on hand (pun intended). Rapping down the south side of Lexington Tower puts you on a short hike over to another rap station where you reconnect with terra firma. And by terra firma, I really mean loose, kitty litter-firma for the hike down a gully toward the base of North Early Winters Spire. Alright—so we’re a little more than halfway through now—just the Early Winters Spires to go. We hopped on the Chockstone Route (Grade II+, 5.7) on North Early Winters Spire (NEWS) which is apparently the easiest route up the most difficult spire in the Liberty Bell group. I would characterize the route as a lot of low quality unappealing stuff, some moderate stuff, and one particularly exciting section… The first pitch was a sort of long meandering pitch up loose, low quality rock… I could see Chad way off in the distance now, toward the end of the rope on this blankish looking section of rock. He was there for quite awhile and I began to wonder if we hadn’t gotten off route. I followed up to this section and saw what had delayed him… trying to protect this awkward traverse. I definitely got a little bit of Elvis leg as I worked my way across this blank, slabby, crimpy traverse. It was quite heart quickening and was most certainly the hardest series of moves that I made during the day. For my Seneca friends, it reminded me of an amped up version of the Skyline Traverse. After that you ascend for a ways up another kitty litter gully to get in a few more pitches of moderate rock climbing. Three or so rappels, including one big free-hanging rappel over the massive Chockstone for which this route is named, and you are back on the ground. From the base of NEWS we hiked around to the start of the South Arete (Grade II, 5.6) on the South Early Winters Spire (SEWS) for our fifth, and final, spire of the day. Here we ran into the only other party of the entire day, as they were wrapping up their climb. I still find it amazing that we didn’t encounter anyone on any of the routes we climbed. Like the Beckey Route up Liberty Bell, the South Arete is one of the easier and more popular routes in Washington Pass. The climb is characterized by two moderate, mid-5th class pitches followed by some low-5th class climbing mixed with lots of 3rd and 4th class. We short-roped much of the top section which was the easy scrambling and then made the airy traverse across this thin fin with a bolt in the middle—from there it was a few hops and a jump up to the summit of SEWS, which we reached at 6:30, just an hour after we set out from the base. It was about another hour to scramble back down the lower class sections and make the couple rappels back to the base. We hoofed it back to the parking lot as fast as we could, trying to beat the soon to set sun. It was quite dark hiking out, particularly as we fell back below the tree line, but we hiked on, sans-headlamps… Making it back to the van at 8:30pm, 15.5 hours from when we set out that morning. This was a big day—certainly the most technical climbing I’ve ever done in a single day (we figured it was 15 pitches of fifth class climbing, plus lots more third and fourth class terrain, and 12 rappels). There were also lots of valuable lessons taught about moving efficiently through changing terrain, rope management, and a number of tips and tricks relating to rappelling. Friday morning we got off to a leisurely start after our big one day push up on Washington Pass. We headed back up to Fun Crag a little later that morning to revisit the rock rescue techniques that we touched on earlier in the week. We climbed up this 5.7 sport route and then went through the factor 2 leader fall rescue scenario from the top on a not-quite vertical situation… Transferring the load, doing a counterbalance rappel, then doing a tandem rappel back to the ground. I was able to work through the process, albeit slowly. We then climbed the same route up to the higher bolts in order to try the same thing but actually in vertical terrain where Chad was hanging directly off my belay device. The process is obviously the same, but is a little more challenging with the added weight and downward pull. This time we did a counterbalance rappel to another set of anchors and then I lowered him off to the ground before rapping down. This is great stuff to know, and I thoroughly enjoy learning more about the technical systems, rock rescue, etc, and is definitely something I need to keep practicing so I am able to keep it fresh in my mind and be able to retain it in the long run. We wrapped up at Fun Crag by 12:30 and then headed into civilization aka Winthrop. The AMTL2 course is designed to culminate with a student-led and organized trip to tackle an objective of their choosing. I was somewhat indecisive about this over the course of the week, but we had mulled over a few ideas that varied from going up to Boston Basin and tackling one of the rock and snow objectives, to something like the West Ridge of Mount Stuart (a more moderate objective than the North Ridge). The idea is to choose something within the students ability to lead. Stuart sounded great initially and was what we headed into town to pick up maps for… But with more research we decided against it—the drive to get permits for Stuart and then hit the trailhead would’ve been something like five hours (ugh) and it is an extremely popular peak that we’d be doing over Labor Day Weekend (crowded). I wanted to stick to an area closer to Washington Pass and hopefully find something a little off the beaten track. With some more brainstorming with Chad, I settled on the Northeast Ridge of Black Peak… We went to a coffee shop to get beta on the route and then picked up the relevant map for the area from the gear shop. We soon thereafter returned to camp to get ready for the approach the following day and to work through our trip plan (estimating approach times, figuring out logistics related to food, water, gear, bivy spot, etc). Saturday morning we once again got off to a leisurely start… After breakfast we started to break down camp and getting ready for our one and only night in the backcountry. We drove up past Washington Pass and headed up to Rainy Pass. The trailhead was absolutely packed with cars as everyone was out enjoying the last, long weekend of summer before the kids go back to school, the days become shorter, and the rain and gray returns to the Northwest. We were on the trail by 11am, starting at an elevation of 4,875ft above sea level. The trail swithbacks and climbs gradually out of the valley and on up to Ann Lake. There were lots of day hikers and families running around and enjoying the beautiful day. From the trail high above Ann Lake you break off onto the well-worn path up and over Heather Pass (~6,000ft). From Heather Pass you gradually lose some elevation as you cross the talus and scree field toward Lewis Lake (~5,700ft). Skirt around the right-hand side (east and north) of the lake and then passing through trees and alpine vegetation, climb steeply out of the bowl up to Wing Lake at 6,900ft. There are numerous campsites and bivy locations around the right-hand side of Wing Lake. We made our way up to a small treed area on an adjacent knoll. The total approach to camp was only three hours from the trailhead. We laid out our bivy gear, had some snacks, and then Chad and I both took a good three hour nap. There really wasn’t much to do now but kill time until dinner and then prep gear for an alpine start. Soon after dinner we both had crawled into our sleeping bags as the light started to fade and the full moon began to rise over the neighboring peaks. Soon thereafter a mountain goat came right up to our camp and meandered around for quite a while. His buddy joined us as well. He seemed to stare at us intently and got within ten feet or so of my bivy spot. He just seemed curious about us, but I kept thinking about the poor guy who got gored and bled to death by a mountain goat in the Olympics a few years ago. He was quite pleased with the grazing opportunity in our area and continued to just hang around… I just went to sleep, but occasionally I would be woken up by the goats rustling around nearby. The alarm went off at 3am on Sunday morning… I jumped out of my sleeping bag to grab my food bag hanging off a tree branch and then quickly returned to the warmth of sleeping bag and bivy—the crisp fall air seems to have already settled in the high country—so I could enjoy coffee and breakfast in bed. I readied the last of my gear and snacks for the days ascent and then stacked some large rocks upon my bivy sack so it would still be there when I returned. We hit the trail by 4am that morning with me leading the way—routefinding and navigating was my responsibility on this trip. We crossed some large scree and talus fields which are always fun and made our way to the base of the large, hard snowfield where we cramponed up. The conditions were perfect for crampons and we quickly made our way up to the S-shaped snow gully which we planned to use to gain the ridge. The hard snow steepened considerably at this point and actually required swinging the ice axe and front-pointing to make our way up. A short scramble up the loose, dirty rock and we were on the ridge proper by 5:30am (an hour and half from Wing Lake). At this point we began swapping leads up the long ridgeline for my very first alpine leads. The climbing itself was mostly moderate fourth class climbing… not really much protection needed or necessarily available. We utilized a 45 meter rope, but many also elect to use a 30 meter rope on this route (the rope isn’t needed for rappelling). The rock quality is okay, but generally suspect—it is good to test every hold and foothold for security. About midaway through the ridge there are maybe two pitches of low to mid-fifth class climbing and some decent exposure down the side of the mountain. This route is sometimes compared to a mini-West Ridge of Forbidden, and I could see some of the similarities. The route returns to fourth or even third class up to the summit and we just simulclimbed the remainder without placing protection. The climbing was certainly easy and it made for a great first alpine rock lead for me… I felt confident on the sharp end and the routefinding was pretty straight forward. We reached the summit at 8:30am—three hours after gaining the ridge, and only four and a half hours after leaving camp—quite a quick route. We hung around up top crouched behind the summit boulder to stay out of the wind and enjoyed the phenomenal view across the North Cascades—Mount Goode looked particularly awesome… but you could also see Shuksan which I climbed a few weeks before and the Boston Basin area where I was for the Torment-Forbidden Traverse. Hiking back to camp was pretty straight forward… I made a somewhat sketchy down climb near the summit, though there was apparently an easy ramp option nearby that Chad utilized. Following the cairns and faint trail leads you back down the standard walk-up route on the south side. The route gives way to terrible, chossy, kitty litter hiking for much of the descent back down. Ugh, I’ve gotten particularly tired of all the kitty litter hikes over the past few weeks. We arrived back at camp by 10:30am—a quick and easy descent—and we broke camp and had lunch before the hike out. We were back to the car by 1:30pm, a two-hour hike out, versus three on the way in. We returned to the Early Winters Campground and grabbed the same campsite we had stayed in two days before. Chad proposed heading back to Fun Crag to get in a few more laps on rock… Which wasn’t exactly what I had in mind, we’d been up and on the go for at least 11 hours or so and had already done a fair bit of climbing and hiking… But I agreed. I hoped on a 5.7 and 5.8 route and then Chad reset the rope over this nice slightly overhanging crack climb. He didn’t tell me the grade, but it was obviously a step up. I struggled and flailed around, but made it up to the top with a couple takes, amazingly. After I hit the ground he told me it was a 5.10 climb, which was a first for me (outdoors), so that was pretty cool. Man, it’s great to climb out on the West Coast where you can climb a full grade or two higher than back East! I was pretty spent after that climb so we packed up and headed off to Winthrop to get some real food and a beer at the Old Schoolhouse Brewery. We brought in the Beckey books and the Selected Climbs in the Cascades books to try and settle on some objective for our seventh and final day. I was indecisive again… We tossed around a few ideas like me leading the South Arete on South Early Winters Spire, swapping leads on Kangaroo Temple, or just heading for the Goat Wall. After a few big weekends in a row and now six days straight of climbing, I was definitely feeling the wear and tear of the mountains, and wasn’t sure if I had it in me to do another BIG day in the mountains. In the end I settled on just following Chad on the big bolted sport route Prime Rib on the Goat Wall. We essentially only had a half day today because we’d need to make the long haul back to Bellingham by about 5pm so we could check in with the shop and wrap up the course. So we still had to get up bright and early at 5:30am to break camp and get to the Goat Wall by 7am. The Goat Wall is a huge 1,500ft wall that rises high above the Methow River valley right near the town of Mazama. Prime Rib is apparently the longest moderate sport route in the US and contains 11-pitches of mid-fifth class climbing, with lots in the 5.6-7 range and two short cruxes of 5.8 and 5.9 climbing. The route is unique in that it is bolted the whole way up and is well bolted and well protected. The approach is about 30 minutes or so of scree, talus, and kitty litter trails that climbs steeply out of the valley—fun! The climbing is mostly face and edge climbing and is generally quite enjoyable. The route wanders a bit in the sense that you would climb 3 pitches or so and then hike along a short trail to the base of the cliff and then start climbing again. There are maybe two of these breaks in the climb, but overall it was the most vertical pitches I’ve ever done (as opposed to say climbing lots of pitches but having to make rappels between them). We used a 70-meter rope on this route so we were able to turn 11 pitches into 9 pitches by linking a few. That morning was fairly cold so I started by climbing in my belay gloves (BD Crag Gloves) and actually kept them on for the entire route, mostly just to see if I could get through the 5.8 and 5.9 sections in gloves… Makes for good training for alpine climbing—if only I wore my boots! We topped out at 11am, four hours or so after setting out. The whole purpose of the day was to just get in lots of climbing, which I feel we accomplished. The descent is quite time consuming with many, many rappels to get back down, though the 70 meter rope helped link a few. We were back to the van by 1pm and then started making our way back to Bellingham and back to reality. It’s always hard, especially after a week in the mountains to go back to your desk and work… After a great August in Washington State I’d be heading back to DC in a couple days. Black Diamond Crag Glove: I haven’t really used belay gloves previously for rock climbing, but Chad talked up the benefits of gloves for belaying and rappeling in general, and the AAI gear shop guy spoke highly of these gloves in particular, so both Chad and I purchased a pair before the trip. I got quite a bit of use out of these gloves during the week. I wore them during much of the Washington Pass climbing, wore them throughout the Black Peak climb, and wore (and climbed in) them through all 11-pitches of the Goat Wall. They are great for those chilly mornings, and certainly take the edge off. The gloves handle rope really well and are quite dexterous. I felt comfortable climbing the 5.8 and 5.9 sections on Prime Rib in the gloves, and also used them on some short crack climbs on Washington Pass. They seemed to hold up well, but granted the gloves were brand new. Mountain Laurel Designs eVent Soul Bivy: Got more use out of my bivy during the trip up to Black Peak. Still not used in any adverse conditions, but it was nice to have the bivy sack once again just for shedding wind, providing an extra layer between my sleeping pad and the ground, and having a place to stash gear on summit day. Feathered Friends Vireo: Got more use out of this hoodless, zipperless, lightweight sleeping bag during the Black Peak ascent. Perfect sleeping bag for the summer weather in the Cascades. I remain quite pleased with my purchase.